LVIV, Ukraine -- Even as the conflict between the national government and separatists in eastern Ukraine continues, this city of 750,000 in the west is engineering a renaissance that could be a model for the rest of the country’s development. 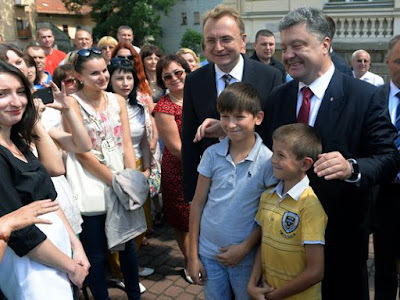 Ukrainian President Petro Poroshenko (R) and the mayor of Lviv Andriy Sadovyi (C) greet people in western Ukrainian city of Lviv, on July 2, 2015. Its makeover includes a new airport, soccer stadium, Ukraine’s first combination shopping-and-entertainment center, a new industrial park anchored by Japan’s Mitsubishi Heavy Industries, new roads and tram lines, renovation of historic landmarks and Western European-style bike paths. Spearheading the transformation is Mayor Andriy Sadovyi, who has not only attracted hundreds of millions of dollars in public-works financing but whose campaign against local government corruption has led to fewer demands on businesses to pay bribes to government bureaucrats. Under Sadovyi's nine-year tenure, Lviv has expanded its world-class, information-technology sector to 15,000 workers. Other businesses also are thriving, including tram manufacturer Electron, Lviv Handmade Chocolate and companies that make clothes for the European brands Hugo Boss and Zara. “Lviv’s example shows that all of Ukraine can be successful” if it puts its mind to it and tackles corruption, Sadovyi said in an interview. Sadovyi said he has personally lobbied several Ukrainian presidents and prime ministers, European governments and development banks for financing to transform his city. “In politics, some people talk and some people do,” he said. A major payoff of the infrastructure-building is a doubling of tourism — from 1 million visitors a year before the European Football Championships in 2012 to a projected 2 million this year. The games were split between Poland and Ukraine, with Lviv one of the host cities. Lviv has sparkling attractions, from castles and forts dating to the 1500s to an opera house that many say is the second most splendid in Europe, behind the Vienna Opera House. The European Bank for Reconstruction and Development, which has financed much of Lviv’s turnaround, is so enthused about the progress that it has opened its second Ukraine office in the city. The other is in the capital, Kiev. Lviv, a lovely Austro-Hungarian Empire city with buildings dating to medieval times, has long considered itself European. Its residents deeply resented the Soviet occupation of the city from the end of World War II until the Soviet Union's breakup 1991. It is not surprising, then, that Lviv has been one of the strongest voices in favor of Ukraine joining the European Union rather than aligning itself with Russia — and that its model for development has been its neighbor Poland, which has prospered under EU membership. But closer ties between Ukraine and the EU have been on hold since last year, when efforts by a new pro-Western government in Kiev to seek agreements with the EU resulted in Russia's seizure of Ukraine's Crimea Province and the start of a rebellion by Russian-backed separatists in the east. Despite tensions with Russia, Lviv continues to establish links to the West. One of the leaders of the city's IT sector is Eleks, which does 98% of its work for companies outside Ukraine, according to Chairman Oleksiy Skrypnyk. Its projects include special effects for Sony Pictures’ James Bond and Spiderman films and other Hollywood studios. The 900-employee company’s other clients are in such fields as cellphones, medicine, financial services, insurance, enterprise and quality assurance. Eleks is also doing work for the Ukrainian military, much of it without charge to support the war effort, said Skrypnyk, who is a member of parliament. With Russian drones providing reconnaissance and weapons-targeting information to separatists, “the question of Ukrainian drones became very critical,” he said. Eleks is not only building components for aerial drones, but is also developing a ground drone to help foot soldiers. The prototype looks like a small tank. Another Lviv high flyer, Electron, made television sets during Soviet times, but after Ukraine’s independence, it switched to heaters and air conditioners, exporting many to Europe. Two years ago, Electron started making mass-transit vehicles to help Ukraine replace 80% of its dilapidated Soviet-era fleet. “We have already sold seven electric trams to the city of Lviv and seven to Kiev,” Electron President Yuriy Bubes said. Electron’s trams cost 40% less to make than those manufactured in Western Europe. The company is building them to European Union standards so it can export there. Electron, whose workforce has been as high as 3,000 in recent years, also makes electric trolleybuses, diesel and electric buses and ambulances. Lviv Handmade Chocolate’s business has soared since Andriy Khudo founded it six years ago. Khudo has capitalized on Lviv’s chocolate-making renown with a new business model: franchised chocolate-based restaurants and gift shops. The outlets are in 30 Ukrainian cities and Krakow, Poland. Part of the 630-employee company’s appeal is being hip. In a country where Russian President Vladimir Putin is widely despised, it has rolled out a chocolate figurine of him in a prisoner’s uniform. It also produces a chocolate Kama Sutra figurine. Khudo credits Lviv’s tourism boom with his ability to open four chocolate restaurants in the city. “We are in the center” of the Lviv surge, he enthused.